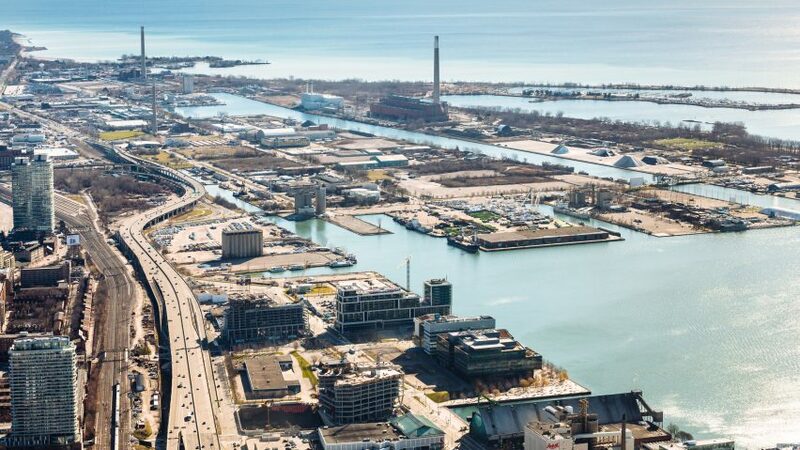 Google's parent company Alphabet has revealed plans to build a new district along the eastern waterfront of Toronto, which will use cutting-edge technology to pioneer a model for future urban developments. Unveiled earlier this week, Sidewalk Toronto is the brainchild of Alphabet subsidiary Sidewalk Labs. The company responded to an open call from Waterfront Toronto, which was seeking a partner to contribute to the revitalisation of an 800-acre (324-hectare) site east of the city's Downtown area, on the edge of Lake Ontario. Now working on the project together, Sidewalk Labs and Waterfront Toronto have imagined a neighbourhood that would incorporate high-tech systems to help solve a slew of current city issues, like a lack of affordable housing, traffic congestion and safety, and environmental impact. "Sidewalk Toronto will combine forward-thinking urban design and new digital technology to create people-centred neighbourhoods that achieve precedent-setting levels of sustainability, affordability, mobility, and economic opportunity," said Sidewalk Labs. Among the ambitions is a digital infrastructure that will connect different neighbourhoods in the district, offering all residents internet connection and providing a way to collect data on the surroundings. Total connectivity will also enable new systems within the city, including a network of self-driving vehicles, and digital navigation tools that aim to make all modes of transport – including cars, bicycles and trains – safer and more efficient. Services provided by health clinics and other community support programmes within the neighbourhood will also be data-driven, as well as easily accessible, to offer better care for residents. "At the core of a future city is a layer of digital infrastructure that provides ubiquitous connectivity for all, offers new insights on the urban environment, and encourages creation and collaboration to address local challenges," says Sidewalk Labs' website. New construction methods will be implemented, intended to make housing and office spaces cheaper, with sustainable features incorporated to reduce energy consumption. Infrastructure will also be designed for different weather conditions so that public spaces can be kept open all year round, and offer a better connection to Toronto's waterfront, beaches and parks. Sidewalk Labs and Waterfront Toronto envision that the area will attract similar forward-thinking companies that will promote Toronto as a tech hub. Alphabet will move Google's Canadian headquarters to the district as a starting point. "Sidewalk Toronto will transform Quayside into a thriving hub for innovation and a community for tens of thousands of people to live, work, and play," said Canadian prime minister Justin Trudeau, who also championed the importance of creativity in tackling global issues earlier this month. "This project offers unprecedented opportunities for Canadian innovators and will create thousands of good, middle class jobs." "The new technologies that emerge from Quayside have the potential to improve city living — making housing more affordable and public transit more convenient for Canadians and their families," he added. "I have no doubt Quayside will become a model for cities around the world and make all of our communities even better places to call home." Sidewalk Labs has invested $50 million USD (£37.8 million) for the initial phase of the project, for which they plan to consult the local community during development. A total of $1.25 billion CAD (£760 million) has also been invested from federal, provincial, and municipal governments to fund necessary infrastructure to protect the area from flooding. Now in its early stages of planning and pilot tests, the scheme is one of a spate of new developments emerging in Toronto, including towers by 3XN, Hariri Pontarini and Pinnacle and Foster + Partners.